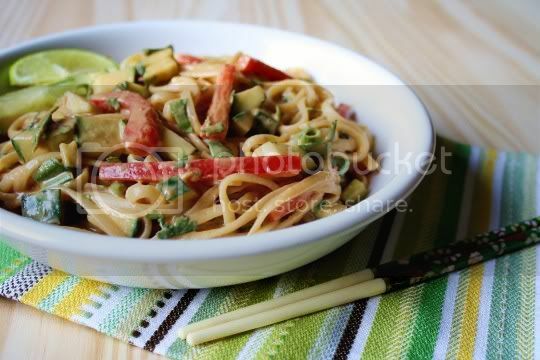 A tasty Asian noodle side dish (or main dish) perfect for complementing veggie proteins, this recipe is quick, easy, and requires mostly common-to-your-kitchen ingredients. 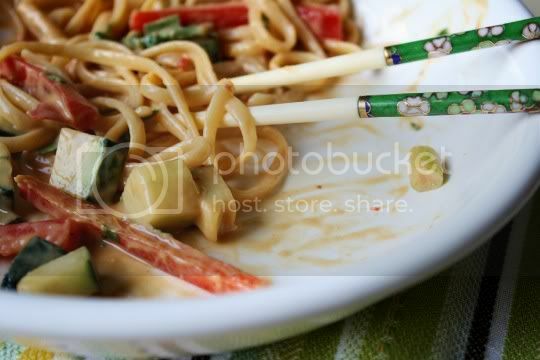 It combines the starchy heartiness of pasta and the fresh lightness of crunchy and flavorful veggies, all tossed in a sweet and savory peanutty sauce. Peanut butter is whisked with water, soy sauce, sugar, rice wine vinegar, and chili paste. I used Lee Kum Kee Chili Garlic Sauce, but you probably can use any variety of Asian chili sauce, such as sriracha. In fact, if you really are trying to achieve some heat, you may want to use sriracha, as I found the chili sauce to be suprisingly mild. I used one heaping teaspoon (the recipe calls for 1-2, depending on taste), but I'd probably go for more like 2-3. 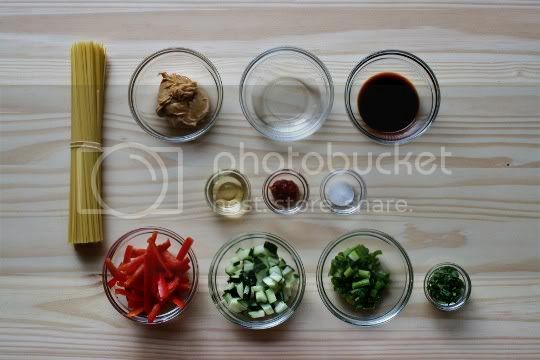 Toss this sauce with cooked linguine (make sure it's fully cooked, and not al dente) and sliced red bell peppers, cucumbers, and green onions. And then, you're done! Sprinkle with some fresh chopped cilantro (well, I mixed mine in with the veggies), and serve with lime wedges. This helps add some tanginess to the sweetness, and thins out the stickiness of the sauce a bit. It's good served slightly warmed, or at room temperature, or even chilled! Make again? Yes. A good solid (and easy) recipe. Asian-marinated seitan, tofu, or another meat sub would make this a fabulous main course! that looks really colorful and nicely presented!